Welcome to another Top Ten Things, here at Enuffa.com, where tell y'all about a few of my favorite things. Ten, to be exact. Today what's on my mind is Disney films. Specifically the animated variety. Before Disney was a multimedia, multi-franchise mega-empire, their bread and butter was making well-crafted, feature-length animated movies the whole family could enjoy. So beloved were these films that the studio re-released them every five to ten years so a whole new generation of kids could experience them. Many of them are so engrained in our culture it's hard to imagine what childhood must've been like before Walt Disney came along. Our first entry is one that frankly hasn't aged all that well for me, 1991's Beauty and the Beast. While this one holds up as a visually rich, touching love story that appeals to viewers of all ages, it strikes me as far less timeless than some of its animated brethren. The voice acting and songwriting is very much out of an early 90s Broadway production which firmly dates the film for me (along with the unnecessary use of computer animation in that one scene). 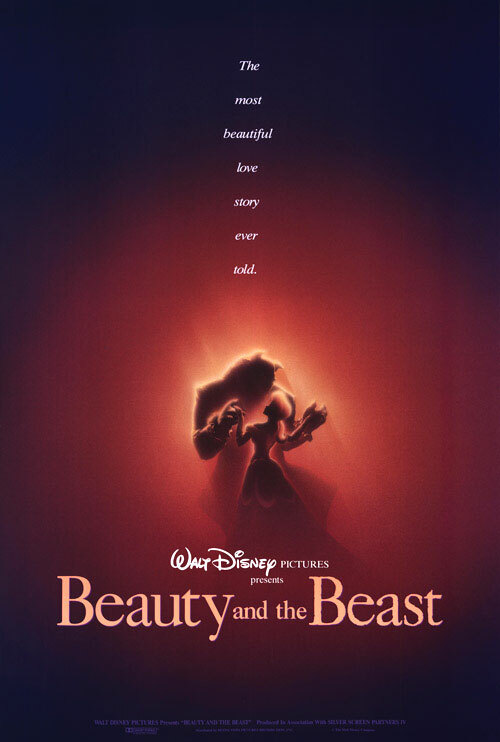 Nevertheless BATB is still widely hailed as an all-time classic that, like The Little Mermaid, returned Disney's animation studio to its former glory throughout the 90s. Easily my favorite Disney feature of the 1980s was this take on the Sherlock Holmes mythos, with all the characters recast as small animals. The Sherlock figure is now a mouse called Basil, his Dr. Watson-esque partner is Dr. Dawson, and the film's diabolical Moriarty character is a rat, known as Professor Ratigan. 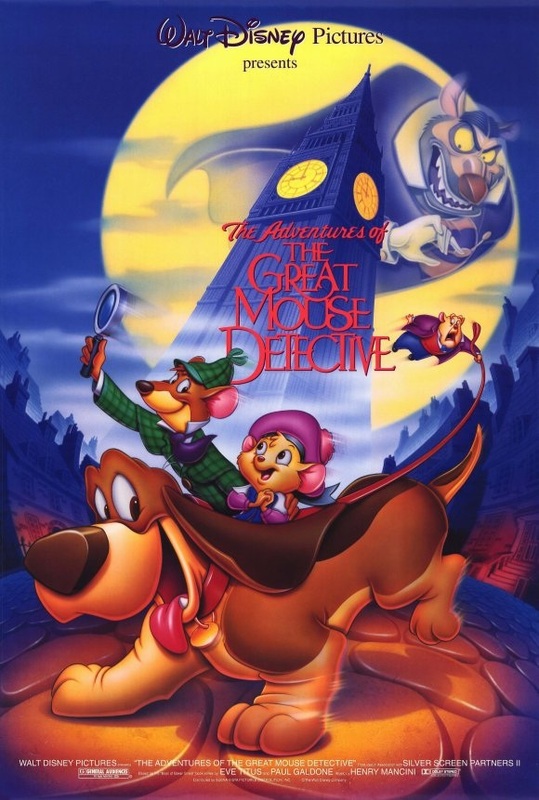 The Great Mouse Detective is a delightful action-adventure cartoon that sees Basil and Dawson helping a young girl find her kidnapped father and climaxes with a thrilling, CG-enhanced chase through the inner workings of Big Ben's clocktower. This affectionate Holmes pastiche was only a modest box office success but I consider it an underappreciated near-classic. One of the most purely fun Disney features was this 1961 canine-centric adventure, about a pair of dalmatians (Pongo and Perdita) whose puppies get stolen by a sadistic fur fanatic to be made into a coat. Pongo and Perdita enlist the help of a network of dogs in and around London to find their pups, and the story takes them all over the country. This isn't the most substantial Disney film but it's relentlessly entertaining, features an iconic villian in Cruella de Vil, and spawned one of the catchier songs in the Disney catalog. Its animation style places it squarely in the early 60s, but unlike Beauty and the Beast, the datedness works in this film given when it takes place. Disney took a chance in 1942 by releasing a movie purely about forest animals, in which no humans actually appear. 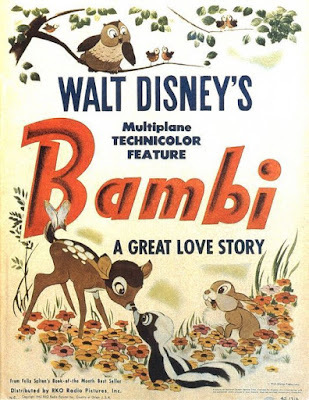 Bambi tells the story of a young fawn and his experiences growing up in the unforgiving wild. Along the way he makes friends with a rabbit and a skunk, loses his mother to hunters, and matures to adulthood. The animation style is lavish and timeless, depicting dense vegetation and realistic wildlife. Bambi's lack of human characters and fantasy elements initially hurt its box office proceeds, but the film eventually grew to become an understated and beloved classic. Taking unusual inspiration from Renaissance paintings and tapestries and mixing them with a somewhat modern character design, Disney created a visually intricate backdrop for their adaptation of the Grimm fairy tale. 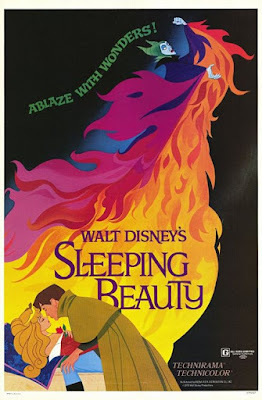 This classic story of a princess cursed by a jealous fairy to be killed on her sixteenth birthday was beautifully animated as Disney's second widescreen presentation, and exhibited on 70mm film. 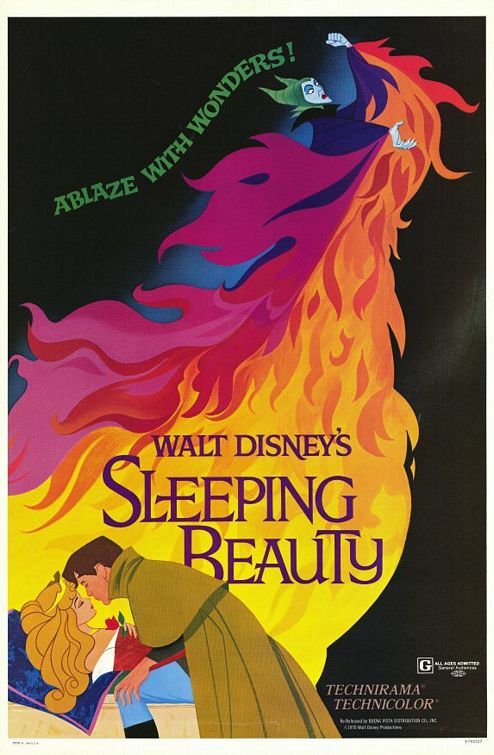 Along with the enchanting story, Disney's Sleeping Beauty most notably brought to life the memorable Good Fairies Flora, Fauna and Merryweather, and of course one of the all-time great screen villains Maleficent, depicted as a fearsome green-skinned sorceress (who later becomes a terrifying giant dragon). This was Disney's most expensive production to date and it initially struggled at the box office before gaining popularity in later releases. Today it holds up as one of the studio's most enduring and extravagant features. Disney's first animated feature is still one of their greatest. Achieving a level of artistry and sophistication unheard of for an animated film in 1937, Snow White adapts the famous Grimm tale with brilliant colors, incredibly lifelike movements, and enduring characters. Yes, the protagonist herself is a bit of a bore, but her seven companions and the evil Queen more than take up the slack, the dwarfs providing touching comedic elements, and the villainess setting the bar for menacing, memorable Disney baddies. With its handpainted backgrounds and multi-plane camera moves, I consider Snow White one of the most beautifully-realized animated films of all time. Few films bring me back to childhood like Peter Pan. The classic tale of the elfin, flying boy from Neverland and his band of Lost Boys, like its title character, never seems to get old. 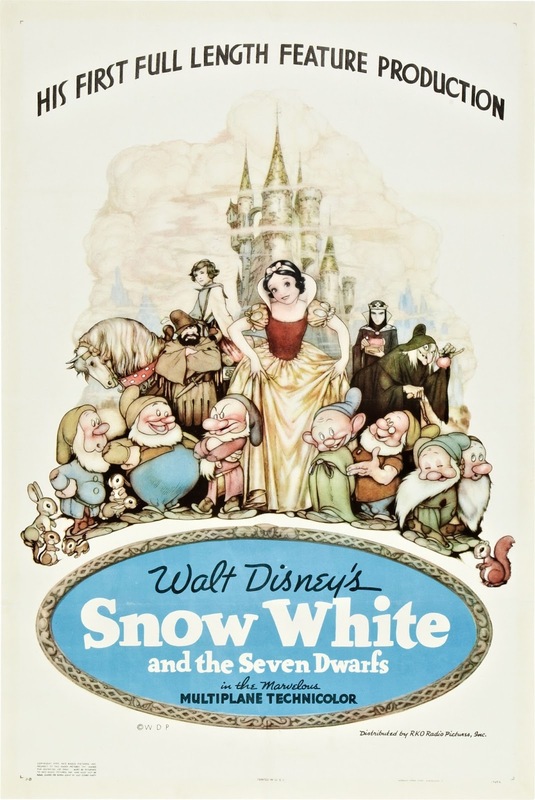 Disney was in the middle of a resurgence in 1953 and the vibrant animation in this film is truly timeless. Peter Pan for my money probably has the best songs of any Disney film; as a child I had the record and must have listened to it a hundred times. 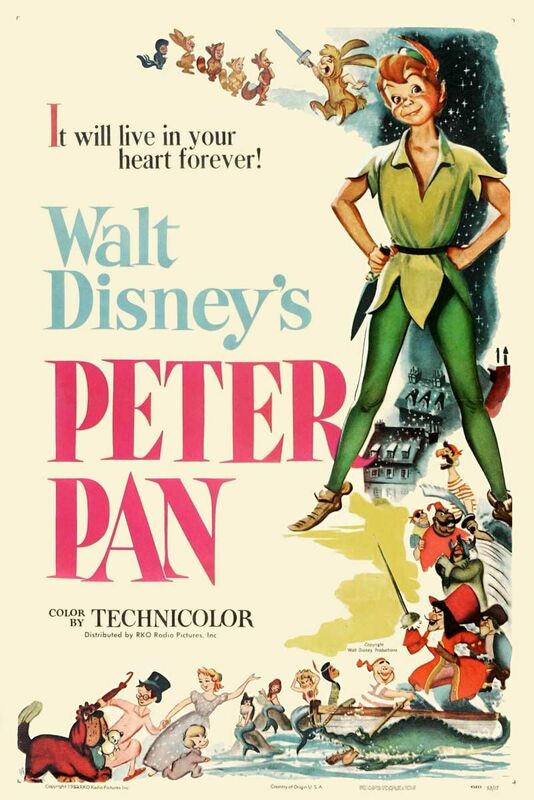 That reason alone is enough to place Pan high on this list, and on top of that the characters and performances are among the best in the Disney pantheon. Aside from the depiction of Native American stereotypes (which to be fair are pretty appalling today) this film, its characters, and especially its songs work as completely now as they did upon its release. 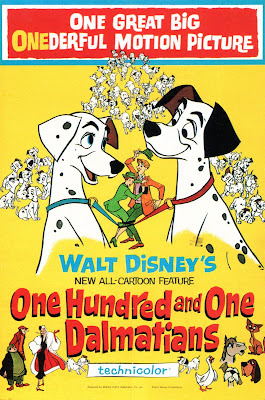 Disney's 1992 adventure-comedy began two trends in animated features. 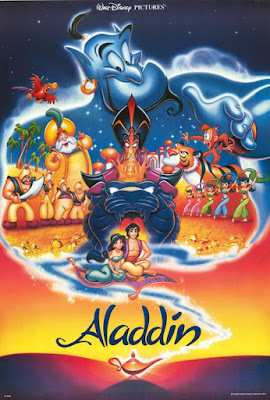 The first was the casting of well-known celebrities in major roles (Beauty and the Beast utilized the voice talent of Angela Lansbury but that went somewhat under the radar), with Gilbert Godfried as the evil parrot Iago, and of course the incomparable Robin Williams in a show stealing turn as The Genie. The other trend was the use of contemporary, anachronistic humor, such as The Genie doing impressions of Jack Nicholson and Rodney Dangerfield in a film set centuries ago in the Middle East. While this unconventional approach (mostly due to Williams' unique, frenetic delivery) was forgivable here, it has become a bit tiresome and distracting in subsequent films (Shrek I'm looking in your general direction). 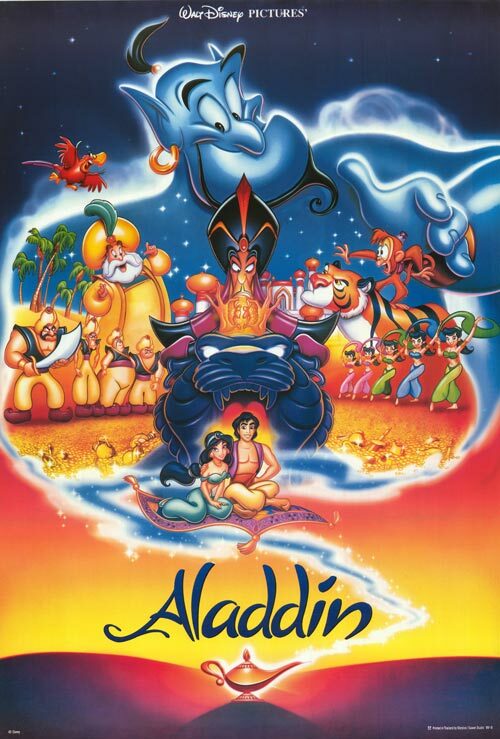 Still Aladdin remains one of the most purely fun, eminently rewatchable Disney films thanks to its sense of adventure and unparalleled humor. Disney broke new ground with this romantic tale about dogs by producing the first animated film shot in CinemaScope, and thus the animation techniques were unlike any used previously. Characters were now free to move around the screen, and the film would employ more expansive, unbroken shots than ever before. 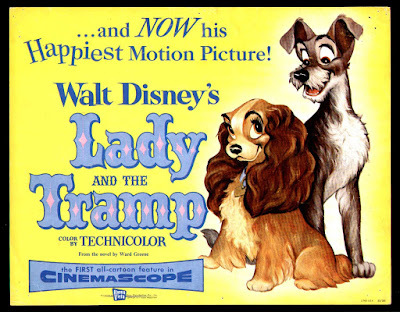 The story itself is one of the few created especially for a Disney feature, concerning a cocker spaniel and her relationship with a disreputable but misunderstood stray. Over the decades it has become one of the most iconic, relatable animated films ever. Anyone who has dogs, simply likes dogs, or has ever been in any kind of romantic relationship can identify with these four-legged characters and their misadventures. It's one of those rare films that appeals to every age group and demographic. 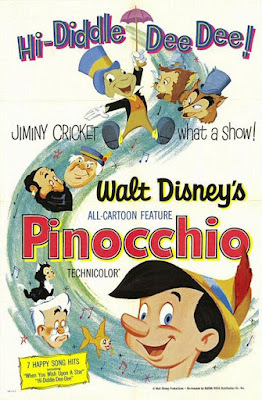 For me the conversation about the best animated feature begins and ends with 1940's Pinocchio. This eternal fable about a wooden marionette who yearns to be a real boy resonates with children and adults alike, hammering home themes about honesty and selflessness in the face of adversity. Pinocchio was the first film I remember seeing in a theater and it's never left me. The lovable protagonists, the charming adventures, the classic songs, the terrifying Stromboli, the menacing Coachman, and most of all the awesome Monstro the Whale are all seared into my consciousness. If Snow White educated audiences about the capabilities of animation, Pinocchio perfected the medium. I consider it not only Disney's finest achievement, but one of the greatest and most endearing films of all time. And that's how I feel about Disney movies. Comment below with your rankings, and thanks for reading! Follow us on Facebook, Twitter, Google+ and subscribe to our YouTube channel!